I set up a small page dedicated to this book. You'll find it at www.networkdocumentationworkbook.com. Please also see an older bog pst about this book. This book is out of Print. It is available only at an e-book. he e-book version is only $79.95. Basically, we've had a nice long run. Maybe someday there will be a version 2.0. But for now, this book is out of print. The book in .pdf format 8.5" x 11"
You get the entire book and CD as they were originally published. That means all the forms in both .pdf format and .doc/.xls format, so you can customize them, update them, and add your logo. If you do not have Roxio, Nero, or another CD burning software that easily creates CDs from ISO images, we recommend the ISO Powertoy at http://isorecorder.alexfeinman.com/isorecorder.htm. We all say we need to document that network someday. Well someday is here! The Network Documentation Workbook came out of the standard procedures of KPEnterprises, a small business consulting firm in Sacramento, CA. The "Consultant Edition" allows you to document all of your clients' networks. You get all the forms on CD-ROM in both Word and PDF format. You can customize them for your operation, including putting your own logo on the forms. This book is guaranteed to improve your business. Thousands of companies have used this book to improve and standardize their processes, document their client networks, and take their businesses to the next level -- and so can you! - What's the password to the firewall? - Which IP address should I assign to the new printer? - How much memory's in the boss' PC? Everyone knows you have to document your network, but everyone hates doing it! 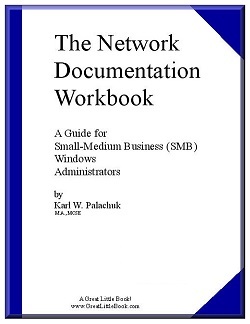 The Network Documentation Workbook will make this chore as easy as can be. Whether you are a Network Administrator looking to document one domain, or a Professional Consultant looking for a standard approach to documenting dozens of networks, this workbook is for you. This is not a big fat book of theory. It includes the forms,with explanations and examples, and best practices for documenting small business networks. My approach is to create a binder that includes all the important documentation for your network: Windows domain information, server configurations, IP addressing, password — Everything! You'll get everything from a Table of Contents to a Monthly Maintenance Checklist, all ready to be copied into your binder. The Consultant Edition includes a CD with all forms in Word and PDF formats. You can customize the word docs with your logo, etc. The Consultant Edition allows you to document all of your clients' networks. "When my laptop got stolen the thing that upset me most was the loss of your Network Documentation Workbook CD-ROM. My documentation has never looked better!" "We've used Karl's documentation book for roughly three months and in that time we've been:"
"Able to reduce call volume for basic questions when other vendors needed to interact with the network (when the new copier was installed for one of our clients they were able to find the documented SMTP server along with the SMTP auth username and password)"
"Able to provide an off-site copy of the network infrastructure so we could plan the upgrade without an on-site visit. Because the template was filled out and stored on our SharePoint we were able to review the network and find out exactly how many components, connectors and cables we needed to bring to order." "Able to bring the new techs up to speed much faster by letting them review network topology, settings and inventory from our SharePoint." "Karl's approach is great. He has taken a monotonous, boring task and turned it into a sales tool." "Whether you are a seasoned IT consultant or just starting out, this book will save you precious time in creating a documentation solution for your client's networks. We all say we document our client networks and most of us do in some way, but this book covers everything and gives you a solid foundation to grow from without having to spend the many, many hours it takes to create a good documentation procedure for your business. As the owner of a small IT services firm, this book along with it's documentation gave me a solid foundation for our documentation procedures without spending hours and hours doing it myself. This book is well worth the price!"